My recent foray into playing the old Deus Ex led to an understanding that there had also been progress on "enhancing" the gameplay and technology of Lucasarts' 1995 Star Wars shooter Dark Forces. 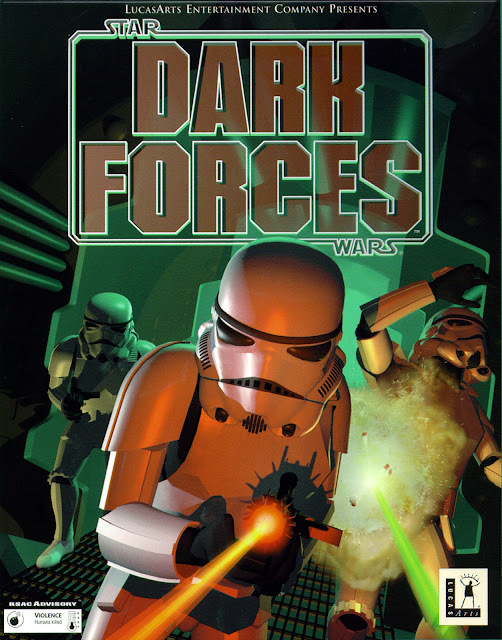 This piqued my interest as by today's standards Dark Forces is ancient, my devotion to Star Wars is obvious, I had fond memories of the game, I bought it in October on a GOG sale for €2 and hadn't tried it out yet. Sadly playing such old games on a 28" 4K monitor isn't ideal so enhancements are required and I was eager to see if they worked. Dark Forces is now 23 years old and on boot-up it certainly looks it. Also, you likely won't be able to point and shoot because of the controls. 1n 1995, no one, not even Doom developers ID had created a 3D shooter environment in which a player could look / shoot up or down before. There was also no mouselook, instead you used PgUp/PgDn to aim upwards and downwards and the arrow keys moved you around. While GOG's Dark Forces Dos Box solution adds mouse control, the solution is a terrible mouse/keyboard control solution for the game. The graphics have been addressed with DarkXL which was an ambitious project to allow higher resolutions and colour depth as well as a more modern control option (WASD/Mouselook). Sadly development has been halted, which is a shame because there are a few obstacles that can't be overcome due to the engine changes and unless you're prepare to work around them, you will encounter a game breaking bug or two. This Steam thread discusses DarkXL in depth, but it's the same issue for GOG. An alternative to DarkXL is Dark Forces Plus, a "compilation of key mappings and a GlovePie script that is intended to allow the game to be played more like a modern FPS while retaining close to a vanilla aesthetic". It wasn't my intention to play the whole game and I was intrigued with DarkXL, how it would look, run and how far I could get using it so I went with that option to take me back to a time when they made great Star Wars games. The difference in using DarkXL was phenomenal by comparison to vanilla Dark Forces. Firstly I could control movement and aiming as one can in today's FPS. There was no pixelation of graphics, yes the resolution is still low - not expecting miracles but there was light mapping, glow and antialiasing galore and I was getting a much more immersive and smooth gameplay experience overall. The best way is to show you the difference using these YouTube videos someone created specifically to show the difference between vanilla Dark Forces (top) and DarkXL enabled Dark Forces (bottom). Notice how jagged everything is in the first video and how harsh e.g. the ceiling tiles look as you move. Then compare it to the DarkXL beneath. I stopped at the "Level 9 crash" as mentioned in the mod's notes, but up to that point there was a flood of nostalgia coming through the screen at me. As DarkXL is open source I hope some enterprising individual can pick up the mantle of it's developer and correct the few (but considerably large) bugs that remain. The Dark Forces / Jedi Knight games have fantastic level design that made the best use of vertical space unmatched by anything since. The sights, sounds, enemies and weapons are all Star Wars, it's certainly not Doom in a Star Wars skin. The story and it's protagonist Kyle Katarn were one of the keystones of what was known as the Star Wars Expanded Universe, and while rendered non-canonical now due to Disney's "Legacy" directive it can still be enjoyed for what it is - a great game that spawned the Jedi Knight sequels. While of course technically inferior more than 20 years on, no one who had played them can forget them unlike many such games since. Pros: It's Star Wars. Outstanding level design. Interesting plot for a shooter, probably the first FPS with an interesting plot. Cons: Ancient tech but mods have lessened the impact to a great degree. Sadly it's difficult to finish the game with them without some hacks. Available from GOG @ €4.89 or Steam @ €4.99 - but wait for sales to pick it up for €2 or so.